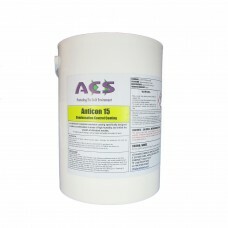 Anticon 15 is suitable for commercial, industrial and domestic use for reducing the incidence of condensation on ceilings and walls1.Anticon 15 works in two ways; initially providing an insulating layer to keep the surface temperature above the dewpoint, delaying the onset of surface condensation. Secondly, at times of high humidity by adsorbing atmospheric moisture, reducing droplet formation and releasing the trapped moisture as vapour when the relative humidity drops. Anticon 15 find applications in hospitals, schools, farms, breweries, offices, factories and domestic property, in kitchens, shower rooms, animal-rearing sheds and other areas where condensation is a problem or causes spoilage. 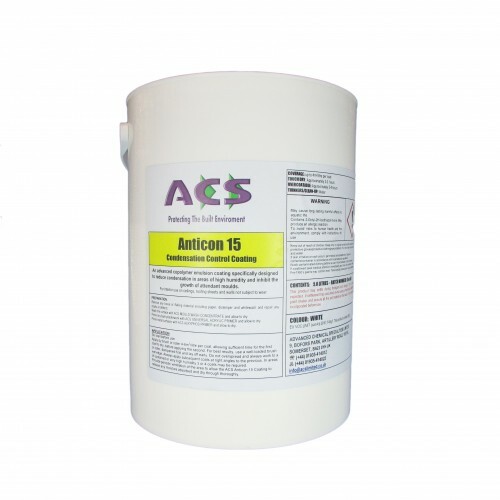 Anticon 15 contains an in-can biocide to protect the applied film from fungal growth. White, Magnolia plus selected pastel shades. Glossy surfaces or oil based finishes: should be lightly abraded with aluminium oxide paper, washed with a mild detergent solution, rinsed with clean water and allowed to dry. Alternatively, clean the surface with sugar soap solution and apply one coat of ACS Universal Acrylic Antistain Primer. Ferrous metals: should be corrosion free or cleaned to a minimum of SA 2.5. Apply one coat of Alkyphos Zinc Phosphate Primer and allow to dry thoroughly. Inspect for signs of flash rusting prior to application of Anticon 15. If corrosion is evident, rub down and apply a second coat of Alkyphos Primer. Porous masonry and new plaster: should be allowed to dry thoroughly. Apply one coat of ACS Acrylic Surface Sealer and allow to dry. This should also be used on un-painted Artex or similar textured finishes. Treat any existing mould with ACS Mould Wash Concentrate, diluted with water and allow to dry. Do not thin. Apply by brush, roller or spray (for spray application contact the Technical Department at ACS for equipment specifications and application details). Anticon 15 will require periods of low humidity to allow any trapped water to evaporate from the coating, especially in areas of constant or very high humidity. Anticon 15 must be allowed to dry thoroughly before the area is returned to service. Therefore we recommend that showers etc are not used for a minimum of 24 hours after application. 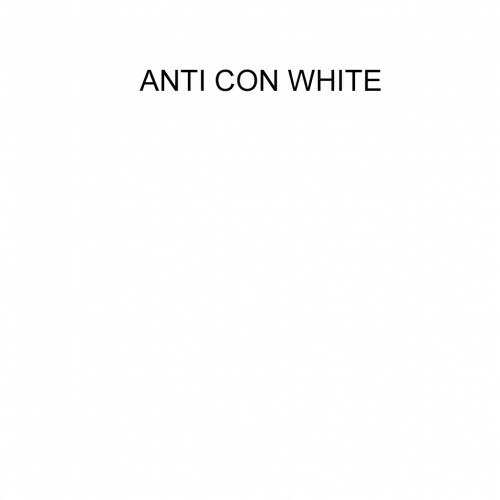 1Anticon 15 is a relatively hard coating and may be used on walls provided they are not subjected to wear or frequent washing. Some dirt pick-up may be noticed which can be removed by gentle wiping with a damp cloth. However surfaces subject to a high degree of soiling may retain dirt. If used on walls, Anticon 15 may be over-painted with ACS Antimould Emulsion to provide a more dirt and wear resistant finish, However this will degrade the ability of the coating to adsorb moisture, although it will still provide some of its thermal insulation qualities. Any person proposing to use this product should make arrangements to assess the suitability for application prior to commencing work. Samples can be arranged if required. There are basic measures property owners can take, which will help keep mould and condensation to a minimum. 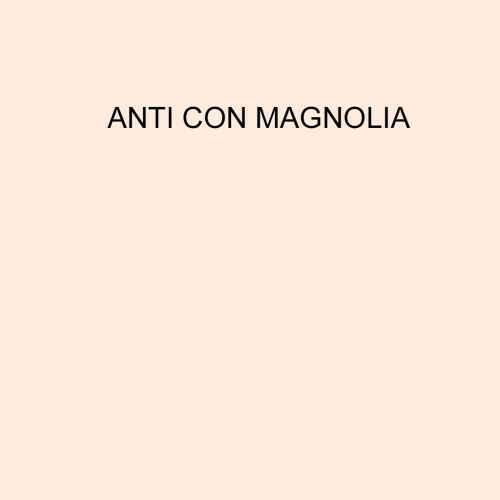 Anticon 15 will compliment these practical points.